The Animated Woman: Deeds & Magpie! 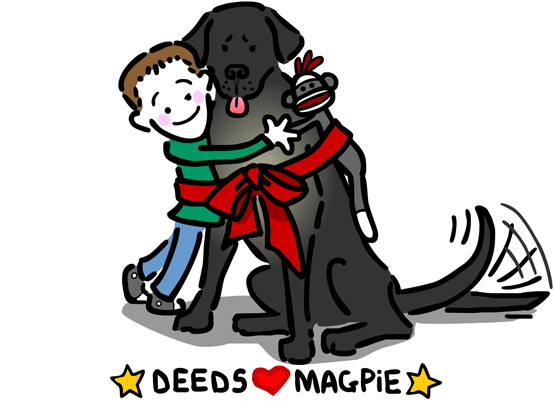 Little Deeds doesn't know it yet but he's getting an updated version of the Dog4Deeds drawing with Magpie on a t-shirt. Don't know who Deeds is? He's a little boy with autism. And Magpie is his autism service dog - she keeps an eye on him. It was nearly a year ago that Caryn Haluska AKA @ihave7monsters recruited me to help Deeds' family. Back then, none of us knew what kind of dog would be found for Deeds, so I drew a Golden Retriever. Turns out Magpie is a pretty Black Lab! I'm still so proud of what we achieved together. It was one of those special social media moments where so many folks came together to help someone. You know who you are. Don't tell Deeds about the t-shirt! areyoukiddingme - Are you kidding me? <<< see whut I done thar. Tears of joy. Sniff. So wonderful and he is going to be SOOOOO excited. You aren't just pretty awesome. You are FREAKISHLY AWESOME! We love you JC. And this is yet another example of why you're ballsome. Love it, love you, just love, love, love. I'm with the others. No, not kidding. love the tail! And the sock monkey! You rock! I'd love to hear how the dog helps him. I clicked on the link & read a few of the posts. Magpie is amazing! Are you going to post the new pic on their Zazzle page? I'd buy one. My son loves his "Maow" shirt you made. You have just achieved even MORE buckets in your buckets of awesomeness. I am honored to have worked with you in the beginning, and I am thrilled you shared with me now. Also? I have happy little tears.